The excerpt below is from the book “Connected From the Start: Global Learning In the Primary Grades,” by Kathy Cassidy, published by Powerful Learning Press. Some teachers I talk to say they do not have time to connect with other classrooms because they are too busy covering their curriculum. In fact, connecting with others is not an addition to our curriculum. It is not something we do after we have finished our reading and math for the day. It is the way we do our curriculum. From practicing counting by fives or comparing similarities and differences via Skype, to writing for a worldwide audience, to making and sharing videos of social studies concepts on our blogs, we connect and invite the world to learn with us and to help us learn. Although learning from others is a key reason why I continue to connect my classroom online, there are many other reasons as well. The world seems to shrink a bit more every day. This has been the pattern for many decades. As this trend continues, the world that my students will be part of in their adult lives will be incredibly connected. Twenty-five years ago, I spent some time living in Thailand. When my husband and I left Canada to move there, we knew that our only connection with our family and friends would be letters and an occasional (and expensive) telephone call. If we were to make that move now, there would be a multitude of ways we could connect with home, both synchronously and asynchronously, anytime we chose. Although having a computer or device with an internet connection in my students’ homes becomes a little more common every year, not every child in my class has this access. Sometimes these children and their parents are able to access the Internet from a relative’s home or from the public library. What is clear is that we are continually moving toward the point at which every family will be connected. These connections are not restricted to our private lives. Business is also becoming more globally connected. It is possible and perhaps even probable that our students will spend much of their working lives in some kind of virtual conversation with colleagues from around the world. If that is even a possibility, we owe it to them to begin to prepare them for that option. We want to get them ready for the world they will be part of, not the world that we lived in as children, or even the world we live in now. The enthusiasm of my students at the discovery of the volcano near the Voyagers’ school was tempered by the fact that they knew volcanoes could be extremely dangerous. Because of our online connection and conversations, they felt about the students in New Zealand the same way as they did about the students in the classroom next door. They were concerned for their safety, and it was important to them to find out if their friends were in danger in the event of a volcanic eruption. It is easy to brush off dangers or catastrophic events when they do not personally affect your life. Knowing others who may be affected by that danger takes something abstract and makes it personal. You begin to care. My students were relieved to discover that the volcano in New Zealand did not spew lava—only ash—and that the ash had never endangered any of the students at the school in Palmerston North. From children in places far from where we live, my students have learned that not everyone has the same alphabet, that people speak other languages, that some areas do not have snow in the winter, that children everywhere learn to read and write, that school rules can be different, and that, yes, there are trees in Wisconsin. Without our online connections, these global understandings might not have been gained for many years, if ever. Kids can often learn better from a classmate or another child than they can from their teacher. If you are a teacher, I’m sure you’ve seen this in your own classroom. I certainly have. I remember one of the moments that this was hammered home to me. One of the objectives in my curriculum at the time was learning the difference between needs and wants. I planned and taught a couple of what I thought were fabulous lessons about what each of these concepts was and the difference between the two. Then, I asked the students to make a Common Craft type of video to show what they had learned. If you are not familiar with Common Craft, they have a series of simple but brilliant videos explaining concepts such as Twitter, social media, RSS and wikis. The camera points at a table and films the narrator’s hands. As he talks, the narrator pulls pieces of paper with simple drawings or words in and out of the camera’s view. My students’ task was to create a similar video to show what they had learned about the difference between needs and wants. When the videos were completed, it was obvious that despite my brilliant teaching, three of the students still did not understand the difference between these two words. Instead of re-teaching, I took those three students aside and showed them videos created by students who obviously had a clear grasp of the concepts. It was like the lights went on. After having seen what their peers had created, those three students all clearly understood the differences, and they were able to go on to create a new video showing this learning. You can probably think of similar things that have happened in your own classroom. Now, imagine those “aha” moments happening through a connection with a child in another place your students have never been and will probably never have a chance to visit. I could have simply told my students that there are volcanoes in New Zealand, or read a book about children who wear uniforms to school, or shown a video about children who live near the ocean. Would my teaching have provoked the same learning? I don’t think so. As we talked with our Kiwi friends below the equator, the children could ask questions and get answers. They could observe the learning of the other children in response to the answers we gave. My students could be part of the lives of people who lived on the other side of the world. This vivid personal connection both inspired their learning and made it more meaningful to them. Some people worry that young children should not be online because they cannot be safe. Instead, I worry that young children who are isolated from social technologies will not learn HOW to be safe online. 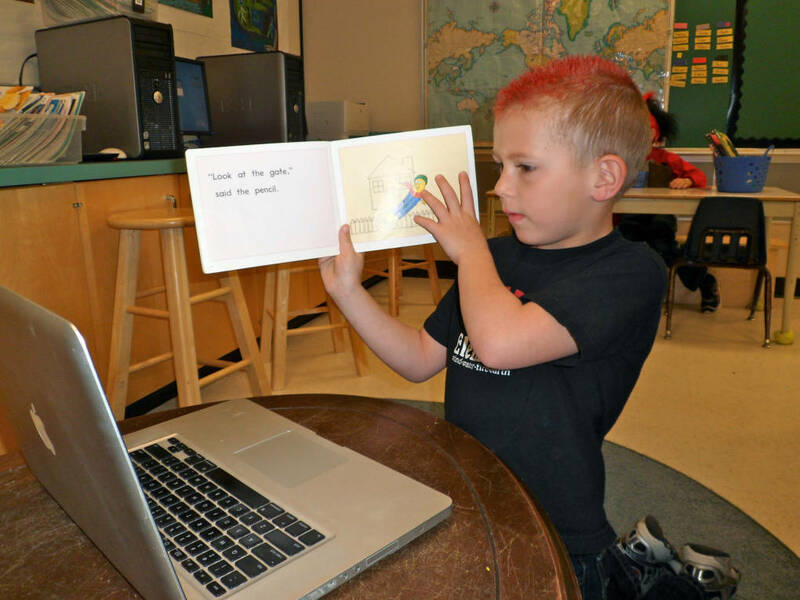 In our increasingly connected world, it is important for even five and six-year-olds to begin to learn what is appropriate when using technology to connect. While I agree we need to take steps to protect children, I think it is equally important that we begin to teach them how to handle themselves in virtual settings. Having them create digital content and interact in a safe manner is essential learning for a child growing up in the Internet age. Unfortunately, we are not having many conversations about this at the level where decisions are made about education policy and practice. Almost everyone knows the story of an adult who, because of something that was posted online, was denied a chance at a job, or lost their employment, or was censured in some way. I know of a young man who was denied a chance to compete for a coveted job in tourism because the sponsoring organization found a video of him online using profanity at a professional football game. Incidents such as this are happening more and more often. The issue of online bullying is also gaining worldwide media attention. Many children and adults do not realize that once something is online, it stays online. You may be able to delete it from your website or Facebook page, but you must assume there will always be a record of what you posted somewhere in cyberspace. As significant as this issue has become in our lives, it will become even more important in the future as our world continues to become more connected. Even 10 years ago, we could never have predicted how important the Internet and the connections it allows would become. A positive digital footprint is on its way to becoming an essential part of all our lives. Even five and six year olds can begin to understand this concept. My curriculum asks me to teach the students how to recognize potential safety risks in play areas. To my students, the Internet is a play area. Online safety is just one of the forms of safety that they need to learn to be healthy and secure as they grow. When my own children were too young to cross the street on their own, I took their hand and crossed with them. As they grew, I let go of their hand and walked beside them. When they were ready, I watched as they crossed the street on their own. Finally, they were ready to do it entirely without me. When my primary-aged students begin to interact online, I do not set them loose to explore on their own. I figuratively take their hand and we do things together. After much modeling, I let the students do it while I watch. When those habits are firmly established, I watch from afar while they do it without me. I do this to ensure that they interact online in a safe and appropriate way. Time and again, our classroom interactions with students far away have resulted in unforeseen learning. When we began connecting with the classroom in New Zealand, I had no idea that they lived near the ocean or that they had a volcano nearby. Those unexpected realities led to serendipitous learning. Over the years, we have “accidentally” discovered that some schools have no girls, that some people go swimming on Christmas Day and that some schools have no school buses. We’ve learned what it looks like to have a tornado drill in a classroom. Year after year, I have let the students “discover” for themselves that when we chat with students in Australia or New Zealand, it is already the next day there. The learning is much stickier when they suddenly perceive that the kids down under are having summer when we are having winter and that not everyone wears snow clothes for four months of the year. One day my class received a package in the mail from New Zealand. It contained some wonderful treasures such as kina and paua shells and ash from a “real” volcano. This led to more wonderful questions about why the pumice was so light and how the paua shell got to be blue inside, and why anyone would think to eat the spiky kina shellfish! More serendipity. These kinds of connections bring something to the classroom that nothing else can. Connecting globally has changed my classroom and my teaching practice in such a profound way that I feel almost claustrophobic thinking about old-style instruction. Maybe you already enjoy this same sense of freedom to connect. If not, let me introduce you to the tools I use to lower our classroom walls and welcome the world in. Kathy Cassidy is a Grade One teacher for Prairie South Schools in Moose Jaw, SK, Canada, and an Apple Distinguished Educator. Since 2005, she has been integrating various technologies into her teaching practice to help “connect” her primary-grades students so they can become global learners. In addition to her widely followed classroom blog, she writes about her professional work at Primary Preoccupation and for the Voices from the Learning Revolution group blog.